Oh, it’s just me and my lawn ornament having a swell time out in the back yard with the owls scrooching and the sun setting and me counting down the days until the MDK Knitting Getaway begins on Thursday. I’ll try not to caps lock all day long BUT IT’S NOT EASY. 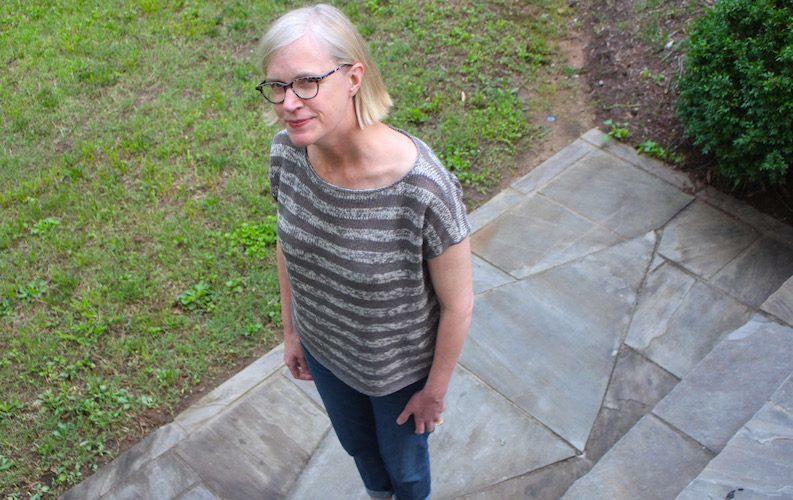 Just two days until we get to Sewanee, Tennessee, where 100 knitters will gather to do . . . whatever 100 knitters do when the entire premise of the weekend is to do exactly as they please. There’s a lot to do before then. We wish you were all going to be there with us. But rest assured, we’ll send dispatches and postcards and whatnot at #MDKKnittingGetaway on the Instagram. We’ll be there until Sunday morning, at which point we may all hunker down and never leave. I submit the following as Proof of Fit, to be added to the Archives of People Wearing Their Shakerag Tops. This garment has at least eight inches of ease. EIGHT INCHES OF EASE. IT DOES NOT TOUCH MY PERSON IN ANY WORRISOME WAY. It allows the sylvan breeze or air conditioning to circulate with abandon. It is unbelievably lightweight. Size: Medium, the second size, finished bust 44″. 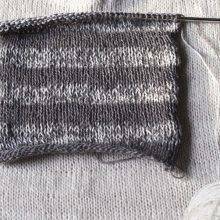 Gauge: I used the specified size 6 needle, and my swatch gave me the specified gauge of 20 sts = 4″. However, this final garment is coming in at 19 sts = 4″, so the finished bust is 46″ which made me very happy because that put the ease for me at 8 dreamtastic inches. Modifications: The biggest change was to make this using two colors of yarn. 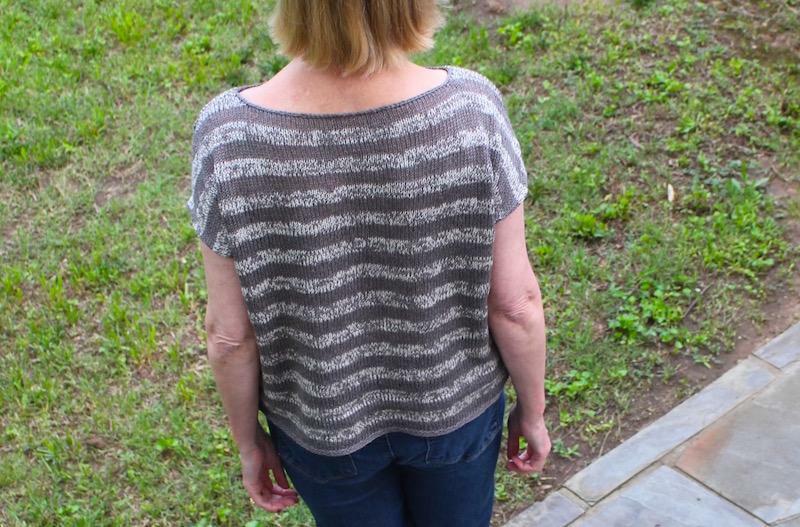 Amy Christoffers’s artful Shakerag Top pattern uses one shade of yarn held double or single to make very subtle stripes. My marl fever led me to hold two colors together for the doubled parts. Another modification was to add a half inch to the armhole depth (6.5″ instead of the 6″ called for in the pattern for the second size). Transparency: Not at all a concern, and I’m one who can get good and concerned about Modesty. PS You’ll want to be sure to hang out online with us this weekend. We are full of schemes and fun for you, even if you can’t make it to the woods of the Cumberland Plateau in southeastern Tennessee. Photos by my long-suffering unpaid intern of 28 years, HUBBO. 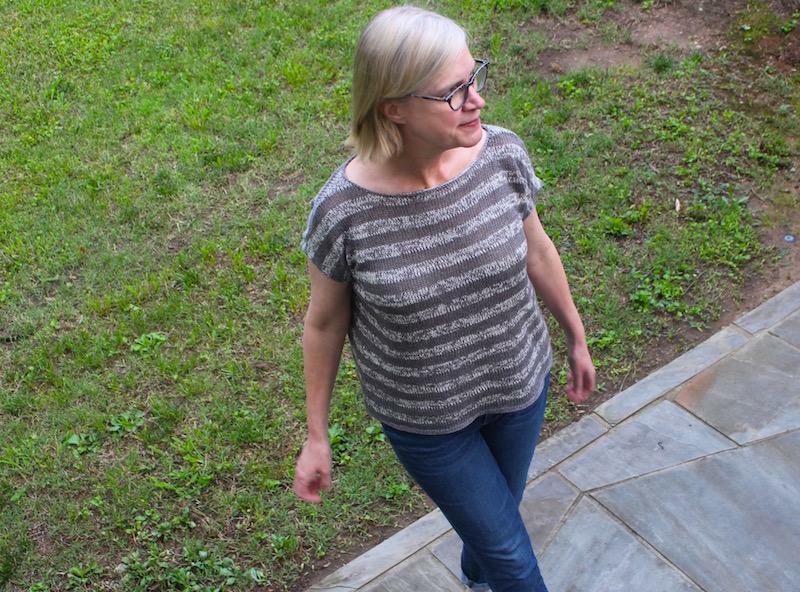 The Shakerag Top Is Easy, Light, Fun, and Lo Cal. 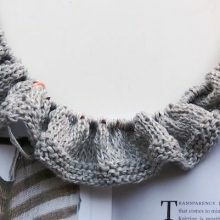 Announcing: A Shakerag Top Knitalong! That is a truly excellent and lovely garment. It’s beautiful and your intern does great work! So cool looking! Can’t wait to cast on my own. I’m leaving today, heading to Shakerag. (Taking the long way there.) Most things are packed. But not my knitting. At the rate I’m going I will be watching 99 knitters this weekend! I have a feeling we can set you up … Looking forward to seeing you! Mind the Bonnaroo traffic on I-24–shouldn’t be much of a problem, but there are 65,000 Bonnaroovians headed to Manchester this weekend, about 20 miles from Sewanee! Ann, your Shakerag looks fantastic! Love the two tone variation, and it fits marvelously! Your post would inspire me to finish mine, but wait: mine came off the needles last night! Will I complete the neck and armhole pickups in time for the June 6 deadline? Hmm, maybe by the 7th. Busy days comin’ up. I suspect it will react well to the wonders of blocking. 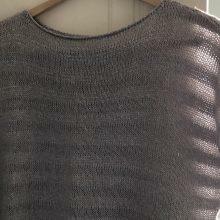 My variation was to do German short rows for the shoulder shaping, and a three needle bind off. I started the step-bind-offs, then remembered that I’m the boss of my knitting, and I could avoid sewing those shoulder seams. Have fun at your knitting getaway! When is that, again? Congratulations on your impressive milestone! I’m experiencing themed knitwear for a retreat envy ! It looks wonderful. It looks amazing! Thanks for sharing your modifications. My husband is my long-suffering photographer. He found one of those flexible tripod things online and says he is going to buy it so he doesn’t have to take my FO pictures anymore. Your Shakerag is beautiful, and the fit most excellent! Beautiful garment! Enjoy the Getaway. I love it! This sweater will be on my list to knit soon! Oh I wish I could go to the retreat!! And meet you lovey ladies!!! Ahhh, I have the worst possible case of startitis at the moment and these pictures are NOT HELPING. Beautiful! I made the scarf out of Sylph and LOVE the feel of the fabric so am seriously considering a Shakerag. BUT as a woman if a certain age I like to hide my upper arms. Do you think it would work to cast on some stitches at the armholes to make the “sleeves” hang down a bit farther?? I think it’s definitely worth a try. 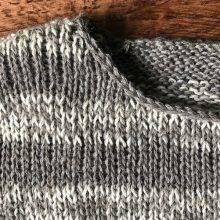 The sleeve edge in the pattern lands on the arm as a sort of dropped sleeve effect, so I think it would work simply to pick up along that edge and knit til the sleeve is as long as you like. Thanks! I’m currently finishing up a Relax that uses exactly that technique, though it does hang down a bit farther. I think I will give it a try! This looks beautiful! Love the marled stripes and the fit especially. Would love sleeves a bit longer, so will look around on Rav to see if anyone has cooked up a mod. Will be curious to see this, too. 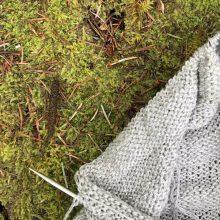 I think it’s simply a matter of picking up along the sleeve opening and knitting down a bit. I think it wouldn’t require much shaping to make a floaty, slightly kimonoesque sleeve. Go for it! Can’t wait to meet you. I’ll be there! It looks fantastic! Your lawn ornament is turning green with envy! I’ll be banging out a Shakerag at Shakerag 🙂 Looking so forward to this weekend!!!!! YAAAAAAAY! I need to get my knitting figured out ASAP! Beautiful!!! Now I want to make one too. Your description and notes are much appreciated. Love it! I’ll be making one. Your top is most excellent! I will be at Shakerag and am giddy with excitement. Trying to sort out my knitting–all projects are at the swatching stage and I am tempted to bring them all along. Are six projects too many to bring for two days? Aaawwwesommme! Mine is just a few inches in, but very much looking forward to that lightweight negative ease here in this Texas summer that suddenly decided to arrive! Technically this is my first wearable project (well, FO to be more precise), so the heat and humidity is not the only thing making me sweat! I’m so excited about this weekend…can’t believe it is finally almost here!!! 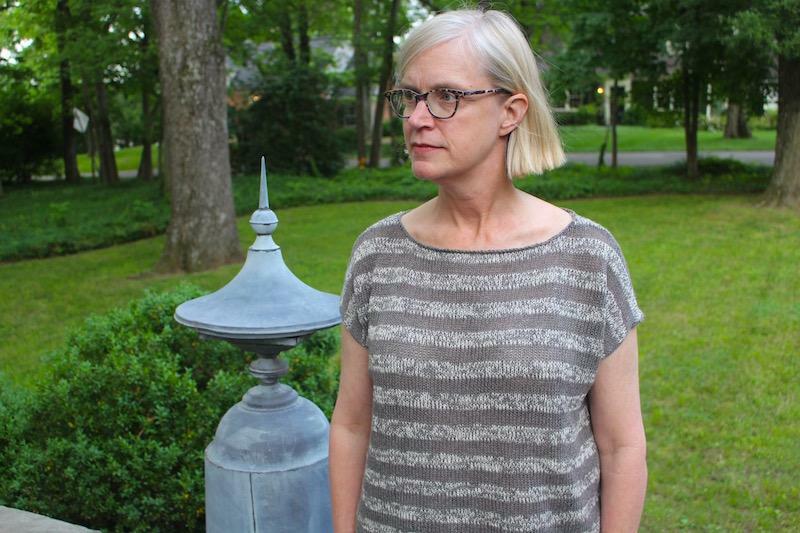 Can’t wait to meet everybody and share the fun of obsessive knitting and the beauties of Sewanee! See you Thursday!! Can’t wait to see it in person. Is Thursday night Shakerag top night, or Friday??? I love this so much! I can’t wait to finish mine so I can wear it too! I’ve just started the front part…this darn full time job is getting in the way of my knitting!!!! Little at a time, I want to changllen myself. I have not been knitting long. Being older, kids and no husband leaves me some time to myself…your sweater is perfect and you wear it very well. Thanks projects are possible. I’m just about packed – still waiting for some items to come out of the dryer. My friend, Judi, and I are leaving SC at 7:30 am tomorrow so we arrive in time for happy hour Can’t wait to meet everyone! Ann. I love this so much. It looks lovely. I especially love your hair. So much! !